My name is Bob Oswalt, better known to some as Bob O. One of my greatest pleasures was seeing Elvis Presley live at the Hilton International Ballroom in Las Vegas in August 1972. Little did I know then that one day I would become the East Texas Elvis. I started my career as an Elvis Tribute Artist in karaoke contests, which led to trophies and cash prizes. Nowadays you'll often find me performing tribute shows around East Texas and Dallas-Fort Worth. 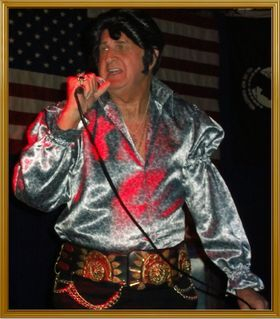 Whether I'm doing a professional gig, a charity act, or just a session with friends, it always gives me a thrill to perform as the East Texas Elvis. I'm looking forward to future shows and participating again in the upcoming 2014 Lake George Elvis Festival in Lake George, New York. I really enjoy getting to meet other tribute artists and fans of Elvis Presley, the greatest entertainer who ever lived and ever will.